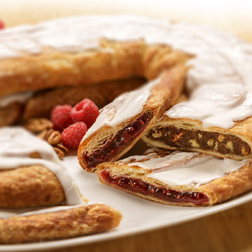 The best flavors of Fall together in one Kringle! 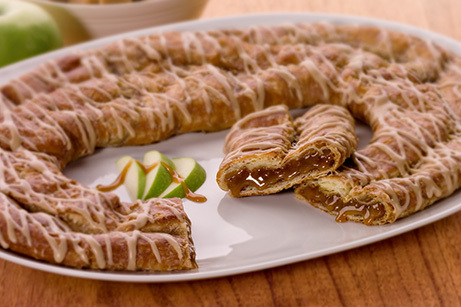 A dessert option for any occasion, our Caramel-Apple Kringle is a blend of tart apples and sweet caramel baked in a buttery crust, and topped with a sweet caramel icing. 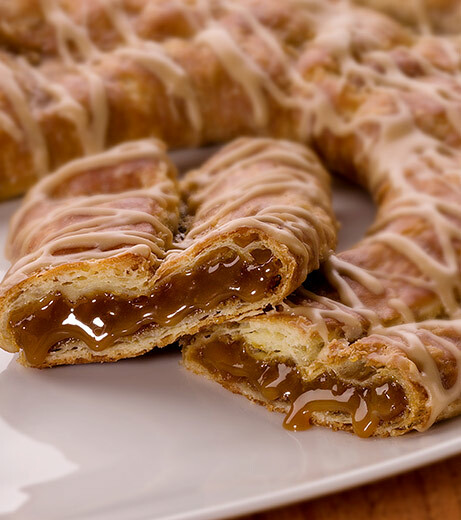 A wonderful treat for yourself or to share with others! Bleached Wheat Flour, Margarine (Interesterified Soybean Oil, Water, Salt, Mono- and Diglycerides, Annatto & Turmeric Color, Calcium Disodium EDTA preservative, Artificial Flavor. Vitamin A Palmitate), Sugar, Apples, Brown Sugar (Sugar, Molasses, Cane Syrup), Corn Syrup, High Fructose Corn Syrup, Eggs, 2% or Less of the Following: Butter (Cream, Salt), Dextrose, Palm Oil, Modified Corn Starch, Nonfat Dry Milk, Soy Protein, Soy Lecithin, Yeast, Natural & Artificial Flavors (milk), Lemon Juice, Red 40, Blue 1, Yellow 5, Calcium Carbonate, Preservatives (Potassium Sorbate, Sodium Propionate, Tocopherols, Calcium Propionate) Citric Acid, Ascorbic Acid, Guar Gum, Maltodextrin, Agar-Agar, Malted Barley, Cinnamon, Nutmeg, Corn Starch, Color Added.